Computerized mandibular scanning (CMS) or “jaw tracking” was invented by Dr. Bernard Jankelson and further developed and perfected by his son Dr. Robert R. Jankelson in 1971. Low frequency Myomonitor TENS (transcutaneous electro stimulation) was first developed by Dr. Jankelson senior in 1964 in conjunction with Myotronics/ Normed, Inc. Tukwila, Washington. The use of computerized electro-diagnostics is a more sophisticated approach to accurately and objectively define and treat TMJ/ TMD. A variety of techniques have been developed to diagnose TMJ diseases and disorders including mandibular jaw tracking (1971), surface electromyography (1980) and electrosonography (1987). In the past these technologies were not available, thus resulting in erroneous conclusion, misdiagnosis, and misguided treatments. Today, accuracy and precision is key and of great significance to the discerning and astute electro-diagnostically oriented clinician. Although there are some opponents that say that there is inadequate evidence to support the use and effectiveness of such diagnostics instrumentation, it is clear that they are misinformed and do not understand how the instrumentation can be used and implemented to aid in the diagnosis and treatment of TMD. Computerized Mandibular Scanning is a more complex assessment of mandibular function using biomedical instrumentation which measures the rotational movement in the frontal and sagittal planes thus confirming a neuromuscular dysfunction. The computerized mandibular scanner measures jaw movement (both qualitatively and quantitatively in several dimensions) to within 0.1 millimeters of accuracy. With a magnetic tracking device and sensor array, it projects the data on a calibrated computer monitor. The CMS measures jaw movement is far more accurate than the eye, making it possible to document characteristics of mandibular motion considered significant to evaluate jaw function. It also identifies the amount of free space, the swallowing pattern, and the quality of the occlusion, and substantiates the presence of disc derangements and their prognosis for reduction. It is a multi-dimensional assessment of torquing movements used to differentiate between contributing factors of a pathologic position to a non-pathologic position on opening and closing of the mandible. It is used in conjunction with EMG recordings. Graphic recording of opening/ closing paths of jaw movements from the side and front views can be analysed to assess abnormal mandibular paths of movement. The speed at which the jaw can open and close is also simultaneously recorded. The literature supports the efficacy of mandibular tracking in the diagnosis and treatment of TMD. There are over 22 controlled published studies that further support the rationale for mandibular jaw tracking. There are 25 additional supporting referenced studies confirming the same. There are numerous other studies that document the clinical efficacy and validity of computerized mandibular scanning. Callender, J.M. Orthodontic application of the mandibular kinesiograph: part II. J. of Clinical Orthodontics. Vol. XVIII, No. 11, pp 791-805, Nov. 1984. Callender, J.M. Orthodontic application of the mandibular kinesiograph: part I. J. of Clinical Orthodontics. Vol. XVIII, No. 10, pp. 710-718, Oct. 1984. George, J.P., Boone, M.E. A clinical study of rest position using the kinesiograph and myomonitor. The Journal of Prosthetic Dentistry. Vol. 41, No. 4, pp 456-462, April 1979. Jankelson, B. Three dimensional orthodontic diagnosis and treatment: a neuromuscular approach. J. of Clinical Orthodontics. Vol. XVIII, No. 9, Sept. 1984. Konchak, P.A., Thomas, N.R., Lanigan, D.T., and Devon, R. Vertical dimension freeway space, a kinesiographic study. The Angle Orthodontist. pp. 145-153, April 1987. Konchak, P., Thomas, N., Lanigan, D., and Devon, R. Freeway space measurement using mandibular kinesiograph and EMG before and after TENS. The Angle Orthodontist. pp. 343-350, October 1988. Wessberg, G.A., Epker, B.N., and Elliott, A.C. 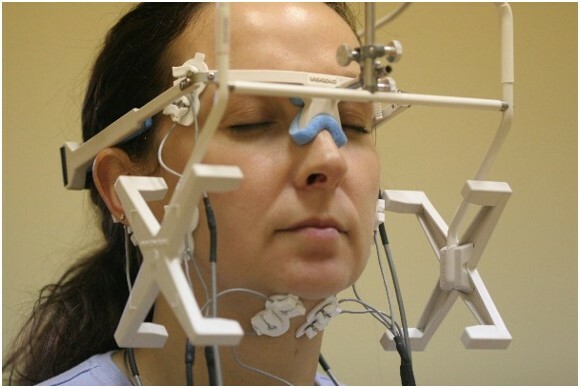 Comparison of mandibular rest positions induced by phonetics, transcutaneous electrical stimulation, and masticatory electromyography. The Journal of Prosthetic Dentistry. Vol. 49, No. 1, pp. 100-105, January 1983. Chaconas, S.J. and Fragiskos, F.D. Vertical dysplasias and myofascial pain dysfunction syndrome. Compend Cont Educ Dent, 11:412-416, 1990.
Cooper, B.C. Neuromuscular occlusion: concept and application. New York State Dent J, 56:24-28, 1990. Dinham, G.A. Myocentric: a clinical appraisal. Angle Orthodontist, 54:211-217, 1984. Maruyama, T., Miyauchi, S., Umekoji, E., Simoosa, T. Analysis of the relationship of centric relation and centric occlusion by the mandibular kinesiograph. J Osaka Univ Dent Sch, 20:173-178, 1980. Shipley, W. Neuromuscular analysis in orthodontics. New York State Dent J, 56:34-36, 1990. Chan, CA: Clinical and Scientific Validation for Optimizing the Neuromuscular Trajectory Using the Chan Protocol. International College of Craniomandibular Orthopedics (ICCMO) Anthology VII, 2005, pp. 1-16. Chan, CA: A Review of the Clinical Significance of the Occlusal Plane: Its Variation and Effect on Head Posture – Optimizing the Neuromuscular Trajectory – a Key to Stabilizing the Occlusal-Cervical Posture. International College of Craniomandibular Orthopedics (ICCMO) Anthology VIII, 2007, pp. 81-113.